Rajjaprabha Dam Golf Course is near the Khao Sok National Park. Dense jungle and virgin forests surround the golf course. Making use of its spectacular natural setting amongst limestone monoliths, Rajjaprabha illustrates the eco-diversity and exhilarating challenges of the Thai golfing experience. 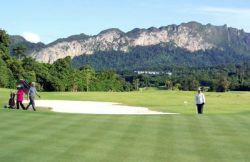 The Royal Samui Golf and Country Club (RSGCC) was founded in 2006 by a small group of golf enthusiasts with the aim to offer an affordable but enjoyable golfing experience in a relaxed and scenic environment. Clinging to the mountainside above the pristine Chaweng and Lamai beaches, the Royal Samui 9-hole course can&apos;t wait to grow up into the 18-holer that its designers meant it to be. Each hole offers panoramic views of adjacent and neighboring holes with many breathtaking elevation changes. The Santiburi Samui Country Club was Koh Samui’s first golf course and provides both challenge and charm with a lush tropical setting. The 18-hole championship golf course came to fame when it hosted the 2006 Bangkok Airways Open. 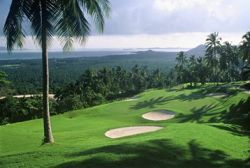 Located on a hillside on Koh Samui’s north shore and amidst old coconut gardens, the golf course has a commanding scenic panoramic view of the Gulf of Thailand and Koh Phangan Island.